The year 2016 is expected to have a substantial increase in the number of work at home agents. However, the practice of adopting cloud based contact center infrastructure started years ago. A 2013 research showed that approximately 3 million Americans work from home on a regular basis as compared to 20,000 in the year 1998. In the US, the year 2015 saw a rise in telecommuting for work from 9% in 1995 to 30%. Worldwide this number has seen to rise from 2.2% in 2008 to 11.1% in 2015. It is estimated that the number of cloud based centers will grow by 25% in 2016 and 2017. How does it benefit the employees? Work-at-home agents can work long hours from the comfort of their homes, saving hours of travel time and avoiding harsh weather conditions. These employees are not restricted by any physical limitations. Even those who have limitations, such as individuals with disabilities, stay at home mothers, pregnant women, retired individuals, people taking care of the elderly, etc., get the opportunity to join the workforce from their homes. In certain cases, employees are given the opportunity to work remotely when circumstances in their family lives arise unexpectedly. Instead of losing valued employees to such circumstances, companies offer the option to telecommute so they can retain top talent. For example, an employee whose spouse needs to relocate can be retained by this method. Home-based agents can also opt for unconventional working hours which can benefit both the employee and the employer. Numerous studies have shown these agents to be less likely to call in sick in order to meet personal obligations because of the flexibility provided by working from home. This system enhances work-life balance and diminishes stress levels, leading to improved worker productivity. Agent satisfaction is also directly proportional to better performance. Several factors have converged to facilitate the trend toward work-at-home agents including the arrival of low cost of desktops, the development of centralized control and better security. In addition, virtual training can be provided to and from any geographical location across the globe. Companies have also increasingly recognized the flexibility that a virtual workforce can provide from an operational standpoint. Unforeseen weather emergencies, special events and rush hour commuting issues have little to no impact on work-at-home employees. The ability to attract experienced individuals to work-at-home positions is another bonus many organizations benefit from. Studies show the average age of a work-at-home agent is 38 compared to 23 for on-site employees. The studies report these workers tend to show more maturity, professionalism and high work ethics, while maintaining the desire to work remotely – all of which leads to better performance and improved levels of customer satisfaction. Companies that employ work-at-home agents also enjoy economic benefits. Higher retention rates lessen the net recruiting cost. Virtual training is easily doable and less expensive than in-house training. Direct cost savings are also achieved through low set up and maintenance costs, consolidation of office space, reduced usage of electricity, lower office supply and furniture needs and a number of other expenses. On an average, it is estimated that for each employee that telecommutes, a company saves approximately $11,000 annually. Due to security reasons, it is predicted that more than half of the Global 1000 companies will store customer details and other important information within the cloud. Use of virtual desktops and software would prevent easy access to data which would help maintain the safety and integrity of the same. Data breach incidences would be reduced tremendously with increasing numbers of work-at-home agents as they are required to follow protocols and all the data would be stored within the cloud. As a point of reference, 70% of organizations with in-house call centers had planned to move to the cloud as of 2014. Is work-at-home the way of the future? Work-at-home agents are now being recruited by different companies. With increasing competition, several employers have been venturing out into this sector. Top industries that have higher numbers of work-at-home agents include medical and health, customer service, sales, computer and IT, administrative, education and training and marketing. It is important that employers are aware of skills, capabilities, strengths and weaknesses of the employees. There was a time when personal meetings were considered the only possible way to share information and to collaborate and work. But with improved digital technology, which includes web conferencing and cloud hosting, such limitations are no longer an issue. It is important to realize that not everyone would prefer one single way of employment. Some companies like Yahoo are still hesitant to adopt telecommuting, but the trend in the near future will be more employers recruiting work-at-home agents. While numbers will vary between countries, more and more employees prefer to work from home and employers are increasingly embracing the benefits it brings to the organization. 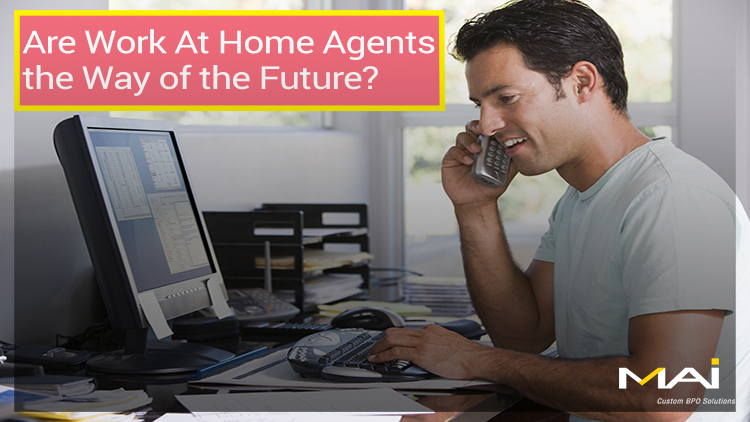 On careful analysis of the pros and cons, work-at-home agents are definitely a trend of the future.